It all started with a daydream in the shower. The location would need to be remote and physically challenging, with just a touch of danger. I pulled out a map. Finger hovering over my home city of Zurich, Switzerland, I traced a line northwest, stopping north of the Norwegian city of Tromsø, well within the Arctic Circle. There I spied some outlying islands. No cruise liners plying nearby waters, no road connections and no wellness retreats serving smashed avocado on toast. Just unpredictable weather and isolation. Perfect. Along with my paddling mates, Justin and Pascal, we spent six months planning the two-week expedition, making checklists, training in freezing rain and testing equipment. At the end of it we were ready to face the ocean and taste the beauty and wilderness surrounding the rocky and rugged islands of Rebbenesøya, Grøtøya and Nordkvaløya. We would camp wild, fish for food and explore some of the regions beautiful mountains and lakes on our 13-foot-long inflatable boards. Day one dawned perfectly. The tension built up in our bodies over six months of listmaking and fretting disappeared as we readied our boards under the bright sunshine. 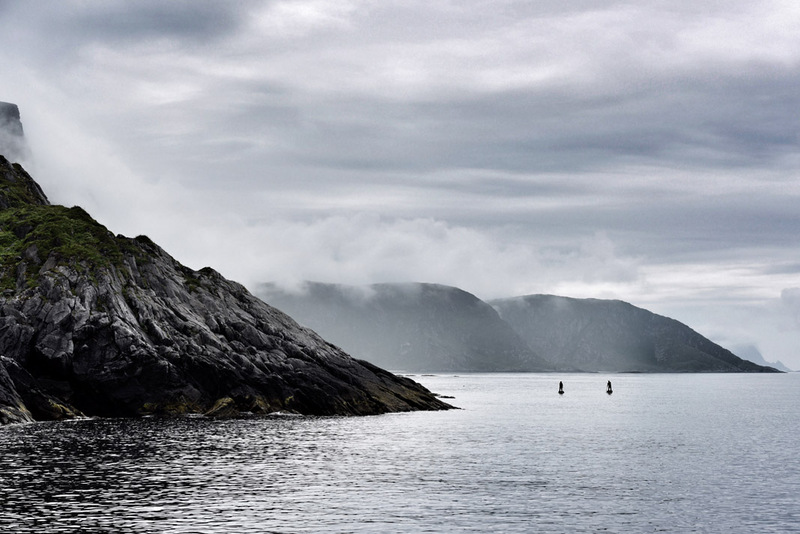 As soon as we stood on our paddleboards, we felt in harmony with the Norwegian Sea. Our paddle blades cut through the calm, crimson blue water silently. Action erased our uncertainties. The landscape smiled at us and we breathed the wind of freedom. Slowly we got used to the midnight sun and the 24-hour summer days. After setting camp, we would go fishing. In this peaceful environment, fishing is a kind of meditation. Eating mussels and fish curry became a culinary highlight. And at the end of each day the three of us would often just sit and admire the surroundings. Whether its sunny or stormy, Norway always puts on a show. Each morning is the start of a new adventure. We packed up our camping gear, food, water, clothing and photography equipment and strapped everything down to the boards in waterproof bags. We paddled between five to 10 hours each day. Most impressive of the islands is Sørfugeløya. Its dark, vertical walls rising from the depths held us spellbound. When the sun shone, the cliff’s texture was exposed—scars from years of heavy winter winds. Images of King Kong and Skull Island fueled the mystery, and it was hard to imagine that Merian C. Cooper wouldn’t have been instantly inspired. Norway brings a mixed bag of weather conditions but we covered good distance. Away from the rush of human civilization, we had all the time in the world to observe the spectacle of nature. Small beneath dramatic towering cliffs, we experienced much wind and rain and were rewarded with seemingly mystical light shows when the sun shone through the clouds. Working as a photographer in northern Norway is a gratifying experience. This is what we live for. Life is good.